Following a sketch I chose 3 shots of my great grands together in the summer of 2018. I was going for coral for a color challenge. Didn’t realize how few coral papers I have. Also my inspiration came for the challenge at “Lasting Memories” to use trim – I have used 3 ribbons. 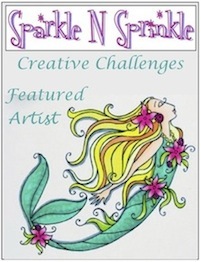 This is our sketch challenge, with a bonus to use at least 10 sequins. I love to use sequins and used 20 here. While trying to think of a good title, I always have difficulty with picking titles. I felt I wanted to acknowledge the idea of siblings being together. With them all being random activities one title about activities wouldn’t work. I’ve been reading a book by Julia Cameron – “Walking in This World”. This Joseph Campbell quote was on a recent page and it stuck with me as a message to my babies. So, the theme for my title and journaling was born. The reason we scrap our photos, or at least for me, is to not just have the enjoyment of the playing creatively in the moment, but to leave an album of pages where the photos will be special for my family to look through in the future. I believe it is much more enjoyable than just flipping through a box of photos that have been printed. That is not to say each page needs to be a masterpiece. That is one thing I am teaching myself lately with my scrapbooking. Fussing over finding the best option is overrated! Does it really matter that I could have used at least 3 other papers for each of the ones I ended up with? I think not. My process of late is to gather possibles, see which ones look the best in my eye and with the photos and go for it. I have way too many papers. It could, and have in the past, taken days to audition more choices; and that wouldn’t bring me any closer to believing I had made the perfect choice. I’m doing my Morning Pages, have been for the past 2 mornings, and I like the focus it is bringing me. What brings you focus in your art? Any tips to help me improve are welcomed if you care to share. In the mean time, have a blessed day, make it full of love and choose to be happy in what ever you must do. Thanks for stopping by! For these photos I was with my granddaughter and little Jovy to go to Leia’s school to pick her up. Being with this one and a half year old is always a new adventure of discovery. On every turn so much to see. Mommy is ever ready for a sudden flight of fancy from her explorer. Sketches in Thyme sketch #353 fit these photos well. There was no need to get too fancy with the great, basic flow of this design, so I went with it. Scrappin’ Peeps offered a December color challenge earlier this month to use gray. I was looking forward to finding gray in with my stash of pretty papers but came up short. I did find the base print in a very old pack of Stampin’ Up! paper. Then, one scrap of this pretty print from Fun Stampers Journey to which I added a coordinating solid gray. Because of the aqua in the pattern I used some Nuvo Embellishment Mousse over a Tim Holtz stencil for my cross flow on the base. A title just didn’t seem important to me, so I used stickers from my very ageing supply. What is really important is the taking of random photos of our loved ones. Time is fleeting and even the tiny moments prove to make my heart happy. That’s what is great about scrappbooking those photos. It makes my heart happy to play and create with paper and other media, and all the while I am establishing a lock on a moment in time to be revisited again another day. I really like this sketch. I’ll likely find myself using it again. Also, the gray. Nice cool neutral that allows the photos to be noticed. Thanks for taking a few minutes out of your valuable on-line time to stop in and read about my scrapping. I wish you time to find your happy place with what ever art or creative play lifts your spirit. Jovy gets to paint the letter A. His mommy gives him fun ways to visually recognize the letters. It is all good! For a while. Then our baby boy discovers his hands have too much paint and nothing he does to remove it is helping. He has always been adverse to messes all his walking-around life, short as it is. So, these are the photos I was inspired to scrap when Sketches in Thyme posted this sketch #351. It impressed me from the beginning, the circle, the multi-media feel, and the basic design of it. I used the Cricut Explore Air to cut the big blue circle. Later cut the work “mess” to use as part of the title. Using some Viva Decor Inka-Gold, the color gold, around the edge of the blue card stock. With a rubber stamp from Fun Stampers Journey I stamped dots with some 3D-Stempel-Farbe from Viva Decor, color copper, around the white background. The ring was created with a tiny brush and Dylusions paint. Finally, the smear of blue was done with the color Steelblue from Viva Decor Inka-Gold with added water. The letter stickers are from Bo Bunny and Jilly Bee Design. I added eyelets to a green strip that I punched with a EK border punch. Also for a challenge at A Cherry on Top that challenged us to use our tools, my tools are the Cricut, border punch and eyelet setting tool kit. With activity centered around our Christmas celebration, it took me a good while to finally finish this layout. Thanks for stopping by! I wish you all the joy you can enjoy as we celebrate this day remembering the birth of the Savior – our Lord from whom all good comes. Our little man is always on the go. He is working at something all the time. See how blurry his tiny feet are? He is always moving – unless he is hungry then he runs and finds Mommy for more fuel. This layout represents the Lasting Memories challenge #423 where we are challenged to use two forms of mixed media. On my orange piece I used acrylic paint over a stencil. I used a rubber stamp to edge the square with some Memento Rich Cocoa ink that looks like some zig zag stitching. I wrapped some layers of twine and made a bow under the photos for added texture. With a Sakura Gelly Roll pen I ran two outlines around the bottom layer of the page, which is from the PhotoPlay Paprika pack. In addition, this sketch is from Sketches in Thyme #350 which is perfect for my two little shots of this busy baby boy. Thanks for stopping by. Hope you like my simple page. How do I show my gratitude? It’s rare at best, I’m sad to say. For a while I have been feeling that the people of the world are a mess. The debate in my head is whether our human race can get any worse. I can’t help but believe there is a great deterioration in humankind. It never fails to amaze me, even after all these years, how answers come to me at church. It was a double for me today. The first wasn’t really a current question or concern, just an ongoing sense of dread and sadness for the state of the human condition. Amazingly, this lack of gratitude has been around for a long, long time. Ninety percent showed no gratitude what so ever! They got what they asked for and kept on walking. Wow. Two centuries ago. And I wonder if we will ever change. This year my “One Little Word” is TURN. I have been focusing on tuning back, mostly. There is a list of “Turn back to” ideas. To the Bible – be more faithful in my studies and daily readings. Our priest started a challenging and in-depth study of the Book of John this September which has been so rich and informative. To my faith – really understanding what my relationship with God is and learning how to enrich my understanding and grow a stronger faith. I have started a Faith Journal where I can explore certain areas as I wish. It has been fun to add some art to it as well. To prayer – not just saying a quick recite of a prayer and moving on, but truly talking with God often during the day. I have found a couple of rich books on praying and it has opened my eyes to the true meaning of our praying. “Pray without seizing” I Thess 5:17. Our memorized prayers are a beautiful help, a starting point from which we continue with our prayer to God. I still have to remind myself to share my gratitude with God as well and bringing requests for help. I still struggle to not criticize or judge when I come across people doing what I believe to be in error. My daughter reminds me “they are not my weed” and so I must move on and pray they will come to know and accept the love God has for them, while I work on my task to ‘love my neighbor’. If you are still following along with my wandering train of thought, you may have noted that I indicated there was another question on my brain this morning. Last night I had trouble sleeping, and when that happens lots of thoughts, mostly unwelcomed ones, popped into my head. When you love someone, especially a brand new baby, you might worry about their well-being. My newest great grand is about 2 and a half months old. With the news yesterday of a condition going on with her mother that the doctors don’t seem to understand, my thoughts drifted to this helpless baby. What is something is wrong with her? She is too little to express much more than pain or discomfort with her cries. It seems so many babies have debilitating issues these days. What is she is one of them? The Priest spoke something about this; I’m sure it was for my benefit. So, bottom line is that she is child of God, she is loved, she is and always will be a blessing to my life and that of all her family. Next year I believe I will choose the word Gratitude. Here are pics of Jovy on his grandmother’s shoulder. Perfectly content. Grandma is content also, to hold her new baby boy. This is another page for an album I am working on for him. I’m using photos of him, but trying to do the earlier ones for him to flip through in his own 8 x 8 album. For the stamping challenge at “Lasting Memories” layout challenge blog I chose to stamp a tiny Polaroid stamp randomly on the base, with a few embossed with white powder. The camera is stamped on white, cut out and popped up on the red tag that I lined with gel pens and stapled a ribbon onto. A Cherry on Top site has a challenge to use a Polaroid on a layout. There are always such inspiring challenges over there – please check out their community. The patterned paper is from Crate Paper. The little rubber stamp is from Hampton Arts. The red Polaroid die is from Stampin’ Up!. The strip of washi tape is from Park Lane. The small letters are stickers from Lilybee Designs. The clear hearts are from Queen & Co., and blue heart is from Fun Stampers Journey. All supplies are quite old stash. So old, in fact, this is the last year (2018) that I will be able to date my pages. I will have use for it as there are still lots of older photos for me yet to scrap. Thanks for popping in, hope your day is blessed with love and happy moments to cherish. Our challenge is to use the technique of tearing paper for a layout. I completely remember the first time this idea of tearing was introduced to me, probably 10 or so years ago. I was appalled at the idea of tearing into perfectly good scrapbook paper. We all know attitudes change, and in our art of creating memory pages with our scrapbooking supplies that is part of the fun. 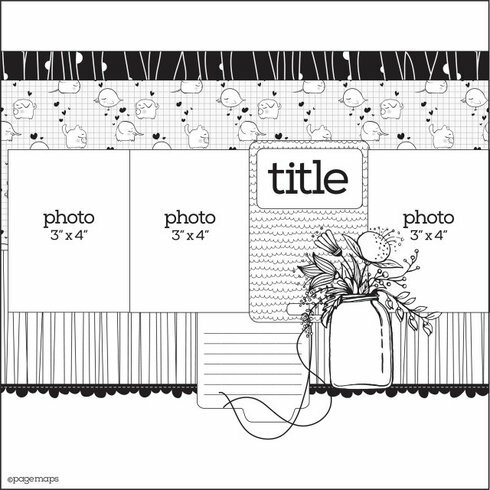 This layout starts with a base sheet of Graphic 45 from the Botanical Tea collection. Additional papers are from Heartfelt Creations, from which I fussy cut the flower accent in the bottom corner. The torn edges are distressed with Ranger Oxide Frayed Burlap ink. I wanted this to be a girly page, because that is who she is – my little great granddaughter. So, I layered it up and added more flowers, butteries, buttons and some sweet vine die cuts. The title was cut on the Cricut. Is the Child Free to Think? Are you ever reminded of a time in the past that you wish you had handled differently? When it comes to relationships I often am. Today while shopping for a few miscellaneous things in Walmart a small child was slapped by the man pushing her cart. She was whining a little, trying to say something she was interested in. Kids are always wanting something when they are paraded through the aisles of a store, that’s human nature. This particular child wasn’t even obnoxious as many I have heard tend to get when wanting something. He was loud, forceful, and totally rude. He certainly stopped her from asking for whatever it was and there was no more whining, just a low, pitiful cry from her tiny voice. This pushed me into instant depression, despite my efforts to let it go in my head. When I get depressed I often revert back to all the things I’ve done wrong in my life. I become full of regret, mostly regarding my children. On my drive home, trying to pull myself away from dwelling in regret, I wanted to share my wisdom with someone in the hopes of lessening their potential for future regret. It’s like that with any knowledge I get, I always think of who I want to share it with. I had hit on this thought of a parent listening to what their child thinks without blowing them off or telling them they shouldn’t think like that, no matter what. Since Leia is the “wind beneath my wings” I thought of things I wanted to say to her mother. This little girl is often the reason I stay afloat some days. If she is sad, I feel her devastation most deeply. When she is happy and delighted about something I, too, am all smiles. Here is what I wish I had done with my children: Listen to what they are feeling without adding judgment. This is critical to get them to trust us with their whole being. As it is, it seems they are only free to tell us what they think we want to hear. What if we let them tell us about the negative thoughts, also? Unfortunately, a parent wants to squelch that negative notion, and thereby banishing their fears. That doesn’t seem to be working out well. Telling a 5 year old not to have negative thoughts – how is that working out? It’s not just about any negative thought the child has, they may have a variety of likes and dislikes they are told to forget, to keep to themselves. Shouldn’t we try to understand all those thoughts our child has? If we do we may better understand what makes them function as they do – sweet or naughty. Getting a child to feel comfortable revealing anything to the parent allows for much better communication between the two. I wish I had done that so maybe my children would have come to me with what was bothering them, with what they perceived was troubling in their life. It is human nature to seek comfort and relief in some form or another, unfortunately, that avenue could be self-destructive. Or, at the minimum, they can choose to distance themselves from us and we will never really know them at the heart. What should we do then, just let them have negative thoughts? No, we don’t want that. What we should want if for the child to be comfortable with telling us everything because this is a test of what kind of relationship bond the two are to have later on. We listen first and when the child is ready to hear a solution then we offer one. I don’t believe we help them over their fear by simply telling them to “get over it”. Here is a simplified example of an exchange. Mom: Please go pick out your jammies, its bath time. Child: My room is dark. Parent: Well, turn on the light! Child: I’m scared of the dark. This is where the parent may resort to yelling at the child to get over it, right? What if we opened up a dialogue with the child to discover what was really going on. Maybe the child is apprehensive about what might be in the dark, or struggles to reach the right spot for the light, or doesn’t want to get the jammies because it means bath time which inevitable means bed time and wants to procrastinate against that. It doesn’t matter what, it is a chance to explore what is going on in the child’s mind. If it is just the fear of the dark, perhaps the child can wait for a moment and the parent will accompany the child so they both can check out what waits in the dark. Soon enough the child lets go of the fear because so far there wasn’t anything to be afraid of for sure. As for the rest of the reasons, the parent has honestly listened to and acknowledged the child, and moves on in the natural order of events. Even if the child didn’t get her way, she got herself heard, and there is quite some satisfaction in that. It doesn’t have to be complicated if we just pause before spouting out what they “should” think. We should never tell them they are stupid for thinking that or feeling that way. They can’t help what they think at a tender age, they need to be guided by someone they can trust to understand, no matter what. One of my biggest fears today is that I will not be understood and accepted for who I really am. Relationships are still very hard for me, I can’t open up and share my true feelings. It takes a good amount of openness for strong relationships with others to develop. Let’s listen to what someone thinks, without being judgmental. Our little ones need to know that what they think just is and can be dealt with without judgment against their person, and is not something to be hushed and buried. The September “Scrap-lift” challenge is up and I got Michele’s gallery to choose from. She has a Lea France page so I had to do that page. Her page is of her baby granddaughter and all pink with a patterned (striped) base page. She has lots of small photos which I rarely have so mine is different. My pics are random shots of Leia, some of which I could cut down a little to fit in this Stain Glass Lea France stencil. I’ve added a few stamped embellishments that DD colored up with Copics for me. Using my Stamp-a-ma-jig I added the sentiments on the crumb cake card stock. I have a little pink glitter paper in there too. This very old pattern paper is SU and I like the girly look it gives with these photos. Although the pattern next to the photos isn’t solid, it sort of reads as solid. Kristy commented that I seem to use a lot of glitter paper with my stencil pages. Perhaps it is my way of adding some “bling” and still keeping it simple. I decided on small words that I printed and encircled with a gel pen to help tie in the variety of photos, uniting the collection. Each photo for me is a delightful memory of time spent with my little precious. Most photos are from early April and the bottom two are early May. I cherish my time with her and now that she is so far away it will be unlikely I’ll see her much. We do get to have some “Face time” on the phone though.